Dragonz - Play For Free or Real Money! As mentioned above, Dragonz is packed with some exciting features, but before you get there, you must place your bet if you are playing for reel money. Click on ‘Coin Size’ to choose your coin denominations, ranging between 0.01 to 0.05, while ‘Coins’ allows you to adjust the number of coins per active payline. Once you are ready you can ‘Spin’ and the game will begin. The wild symbol, which it represented by the orange wild icon, replaces all symbols on the reels except the scatter. The wild can also form winning combinations whenever you land three or more on an activated payline. If you land three or more scatters, the free spins feature will be triggered. These scatters can also contribute towards more wins if you land two or more anywhere on the reels, whereby they are multiplied by the total bet wagered. 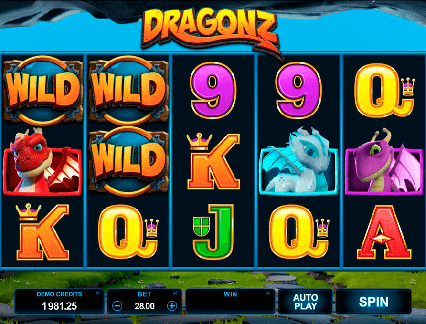 Dragonz features the most excellent 3D graphics that is synonymous with the high-quality offerings from Microgaming. The game features a great cartoonish look and feel that works well for those looking for a fun escape and the chance to win some cool cash rewards. 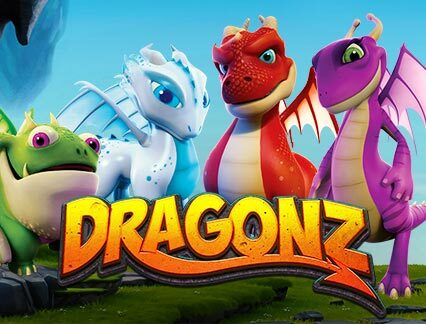 The little Dragonz are adorable and definitely put you in the mood to win, while the features are lucrative and worth your time. The sound effects also capture the game perfectly, providing a fresh and animated background effect to your experience. Dragonz online pokie is available to play from your desktop or mobile device for free or for real money. To play for real, you must make a minimum bet of 0.40 per spin. Overall, the game features an RTP of 96-97%, which is above average for an online pokie. The game’s special feature is definitely its free spins feature, where you select one of four free spins bonus rounds. You should also note that the free spins feature cannot be reactivated. Flint Free Spin – Here you are awarded 10 spins along with Flaming Wilds. Flint fires wilds on all the reels, and the number of wilds increases with every fire. Switch Free Spin – Here you are awarded 10 free spins along with a few Stashed Wilds. Switch stores all non-winning wilds, and when three or more are collected, these are randomly spread to create a sure win. Free spins will then continue until all wilds are awarded. Frosty Free Spin – Receive 10 free spins along with Frosty Wilds. Frosty will freeze non-winning wilds until they make a win. The free spins will continue until no frozen wilds are left on the reels. Gobble Free Spin – Here 10 free spins are awarded along with Winning Wilds. The Gobble feature will spit wilds on the reels and all winning wilds are locked in place until they no longer have any value.